(Bloomberg View) -- Markets are unmoored. Tried-and-true patterns that dictated trading behavior have broken down, leaving many investors at a loss, both figuratively and literally. The Cboe Volatility Index, or VIX, a gauge of stock market volatility derived from the prices of options tied to the S&P 500, has almost doubled in this year’s first quarter. But investors don’t need a metric to tell them what they’ve experienced day-in and day-out since Jan. 26, when the broad market peaked. Intraday trading has been so turbulent that many have had to replace their Red Bull with Dramamine. Veterans of market cycles have experienced many market upheavals, especially after long stretches of calm. Last year’s complacency, however, wiped away any precedent. For context, 18.5 is the long-term average for the VIX; the recent “spiking” to 20 is anything but alarming, historically speaking. Before 2017, 1993 was the record holder for the longest stretch of sub-10 readings on the VIX; the measure dropped below 10 four times that year. In 2017, when central bankers worldwide deployed $2 trillion in quantitative easing, there were 52 days the VIX closed south of 10 followed by seven days at the outset of 2018. The mirror image, quantitative tightening, was never supposed to be market-friendly. Although it’s impossible to draw any conclusions, perhaps investors got their first hint of how QT would unfold with the release of the 2012 Federal Open Market Committee transcripts on Jan. 5, 2018. June 2012 was Powell’s first time as a member of the Federal Open Market Committee. Over the weeks that followed, investors came to know several things about him. For starters, he was no fan of economists’ models or the QE that emanated from the theoreticians’ complicated calculations. QE was “habit-forming,” Powell said, and it encouraged investors to take on more risk than they would otherwise because they knew the Fed would backstop their losses. Powell also insisted that QE’s architects needed to have a clearly stated commitment to shrink the balance sheet even as he voted in favor of the final round of QE -- one in exchange for the other. This did not sound like a man who would cotton to having his name associated with a “put,” as in following in the tradition of his predecessors Alan Greenspan, Ben Bernanke and Janet Yellen. In exchange for this effective rejection, investors greeted Powell on Feb. 5, his first day as Fed chair, with a quadruple-digit selloff in the Dow Jones Industrial Average. As if to validate investors’ worst fears, Powell remained mum as volatility surged, and made no move to calm markets. In his recent congressional testimony, he plainly stated that it wasn’t the Fed’s job to put a floor under the stock market. The so-called smart money took Powell at his word. The Smart Money Flow Index (SMFI) is a derivative of the Dow calculated by measuring two time periods -- the first half-hour of trading and the last hour. The first 30 minutes represent emotional buying, driven by greed and fear of the crowd based on good and bad news. There is also a lot of buying on market orders and short covering at the opening. Smart money waits until the end and they very often test the market before by shorting heavily just to see how the market reacts. Then they move in the big way. According to the formula, if the SMFI does not confirm a new low in the Dow, it communicates a buy signal. But if the Dow hits a high that’s not confirmed by the SMFI, you’d best make for the hills. 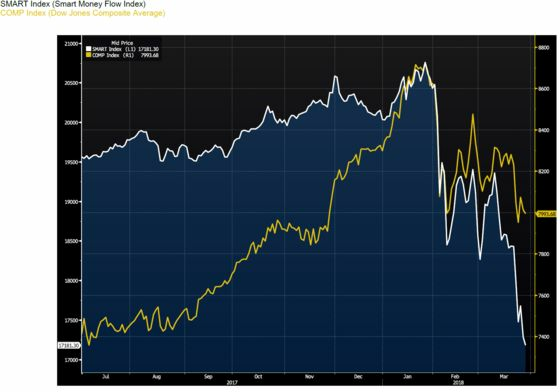 As is evident, the SMFI has fallen to a much greater degree compared to the Dow, implying that the smart money has little faith in stocks’ prospects. Recent confidence surveys corroborate the move. High-income earner confidence has declined dramatically, which has been more than offset by the rebound in confidence among the lowest-income earners. This trend could spell trouble for the broader economy. According to Morgan Stanley, the top two deciles of income earners account for 39 percent of consumption. It won’t take much to topple the global reflation trade if U.S. consumption, which accounts for 18 percent of global gross domestic product, stumbles. Such a development would also push the U.S. economy one step closer to recession. The good news is that the MOVE, a sister index for the bond market based on options pricing in Treasuries, has yet to follow the VIX. Powell would be familiar with the MOVE from his prior life in private equity -- the bond market is an essential conduit to monetize private equity investments, especially when the IPO market seizes up. If bond market volatility does become a problem, that would reflect risk seeping from the equity markets into bonds and in turn suggest that systemic risk could take hold in the financial markets. Contagion is a scarier word than even recession for central bankers. The hope is neither takes hold. Clearly, the smart money isn’t sticking around to find out.